Easter break will start next Thursday at 11:30. There will be no school on Friday, April 19th and all of the following week. School will resume on Monday, April 29th. Jump Rope for Heart is April 29th. If students donated to the American Heart Association, students will need to wear their P.E. uniform and tennis shoes for this event. As a reminder, when there are school events taking place, it is the policy of the Diocese of Raleigh that when you take photos or video of the event you only capture images of your child. 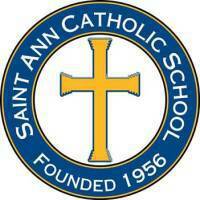 You may not take pictures or video of any other St. Ann student. Thank you for adhering to this policy. Our uniform company will be on campus on May 6th from 2:30-5:30 in order to take orders for uniforms for the next school year. Band registration for next school year is now open! Students in grades 4-8 are eligible to participate in band. Registration forms were given out last week to students who will be entering those grades. The deadline for registration is May 15th. SAVE THE DATE!! Saturday, May 18th, 6:15 PM to 10:00 PM at the St. Ann Catholic Church Social Hall. Make a bid for a cause while enjoying delicious food and adult beverages at the St. Ann Catholic School BIDS FOR BYTES charity auction and party! This event will raise money to replace the school's computer system. Admission is $25 per person. 21 and older, only. Childcare will be provided for $20 per child for the whole night. To reserve a childcare spot please RSVP to Kim Tobler at 253-229-6105. This is no ordinary auction, but a multi-auction event including the following fantastic items: travel packages, sports tickets and merchandise, gift card and wine baskets, cooking classes by Fr. Steve, Handy Man for a Day, Principal for a Day, monthly curb-side pick-up of your child, Christmas and Easter Day pew reservations, passes to Defy Gravity, Woodpeckers baseball, Disney, the Zoo, and more! Take a sneak peak at these items with our soon to be released website. More updates coming soon! Please contact Deanna Turner at deannaturner326@gmail.com with questions. The flier for the event can be found here.